If we were making a Jurassic world cake and we already make cake cars we'd be a bit foolish not to make a Jurassic world Jeep. 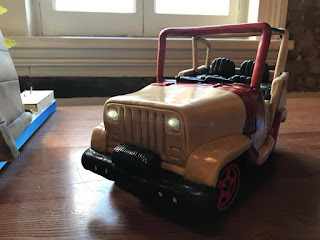 The jeep had a custom version of the car base to lift the vehicle a bit higher up but the mechanics are all essentially the same, meaning the car base can actually be quite versatile. Dawn covered the platform with cake and icing and did all the difficult decorating parts that actually make it look like a car, it's a very impressive job that I believe was completed at stupid o'clock the morning before the event. There's even video of the car driving through the gates (the car determined the size of the gates). I'd like to point out that I wasn't there though because friend don't let friends take vertical video. It's been a busy week getting these cars into production and after a late night last night I finally finished a batch of 8 cars ready for workshops this weekend. I delivered them to Nottingham first thing this morning and as far as I know it's all going well which means I get to sit back and work on some other projects this weekend (Like catching up on some blogging). In the meantime here are some pics of the completed cars. The remote car cakes have a layer of plastic between the cake and the electronics. This needs to be shaped to fit the wheels and provide enough space for actual cake to go onto the car. The vacuum former is the perfect tool for this. I started by taking a mould of an actual toy car about the right size, this ended up being a one shot deal as the toy car melted on the second pull. At this point I had a sheet of plastic in roughly the right shape and a strong desire not to mess up a second time so I scrabbled around the garage to see what my options were. I found a bag of plaster of paris and decide that casting the mould was a sensible way forward. The remote control car cake design was refined to a point where we could run workshops on it, allowing other people to make them. This means small production runs of parts, last night I sat and assembled 32 wheels, each one made from 5 layers of material and then I squeezed rubber tyres onto them. It's mindless work but it needs to be done and at least I get to watch TV at the same time. I cut some more wound point counters tonight, but this time I used air brush paints to fill the lettering. It's thinner than normal acrylic paint, offers great coverage and dries quicker. I definitely recommend it for infill effects. I had the pleasure of attending a Dinkydoodle Designs cake making course today, it was great to go along and learn how to make the cake that goes around the droid heads I've been making for the last 2 years. Because BB9 has a flat top I had to rebuild the whole mechanism to make it fit into the available space, I took the opportunity to make some needed improvements, such as vacuum formed heads and bearings for the moving parts. I also decided to add an ESP8266 into the mix so that the whole thing could be controlled from my phone. I had a great day and would really recommend it for anyone who is looking for something different to do.